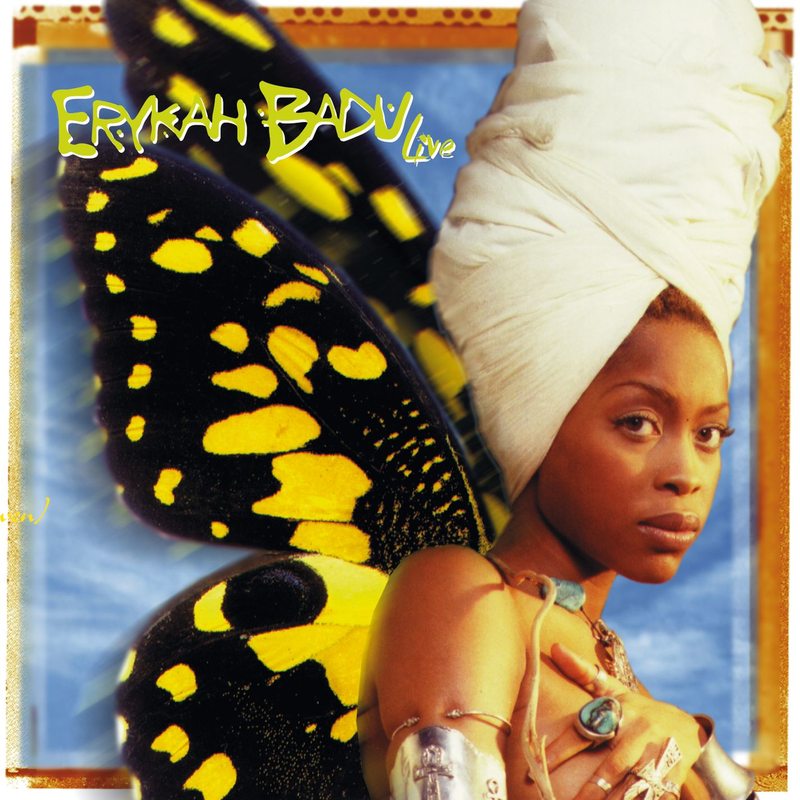 Roots & Rhythm: Erykah Badu - "Apple Tree"
A few weeks ago I did a quick survey on Facebook to see what artists keep you moving through life and one of my favorites came up: Erykah Badu. We've shared Erykah here before of course, but with such varying looks over the years, we can talk about her hair and music and what she has inspired for a while. This led to me to think of the most dramatic change I've made when it came to my hair. I would think that it was when I cut my hair to start my locs, but somehow I think my recent cut was more shocking to others - and to me. What about you? What was your moment? We've seen Miss Badu explore with length, color and texture over the years. 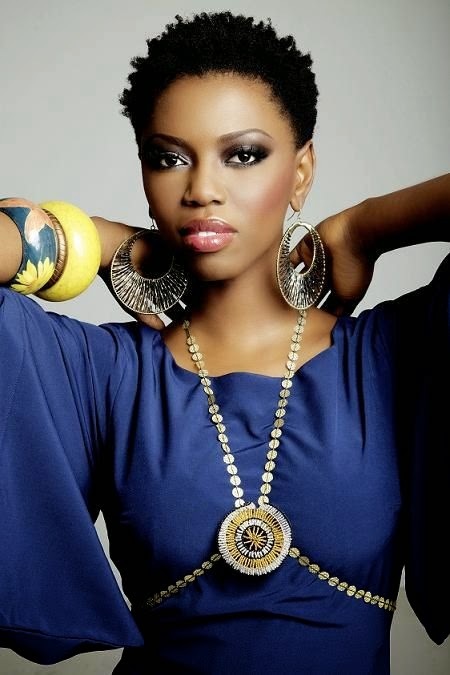 Have you had a similar hair story or was your journey about steady progress with a sudden, drastic move. Take a trip down memory lane on this Flashback Friday! 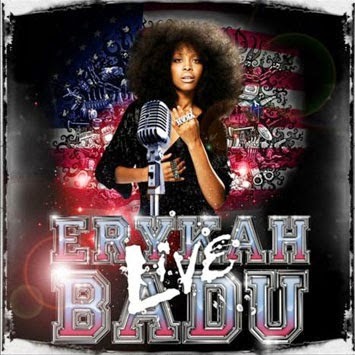 "Apple Tree" from her Live album is one of my favorite songs from Erykah Badu. This version is classic. If you've ever seen her in concert, you know that she may do anything from play the drums to dancing or telling stories and rhyming. If you are a fan and have not seen her live, please do! Enjoy this mini concert performance used as promotion for the Java Jazz Festival in 2012. Kenya McClain, this one is for you! 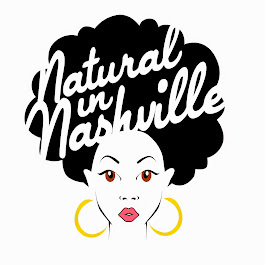 Thank you for being a part of the Natural in Nashville community! 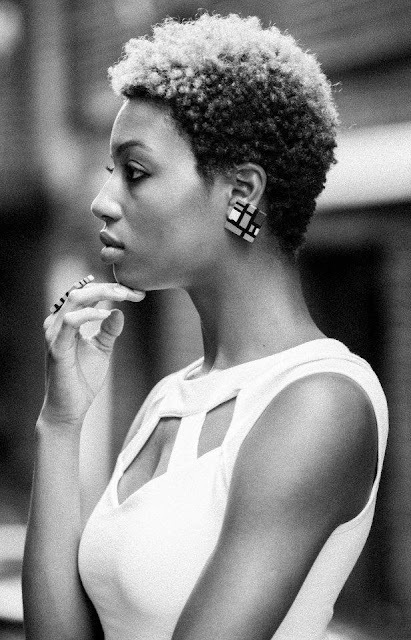 Style concept and cut by Amber Curry. Yes. This really happened today. Not because I wanted it to, but because it needed to. 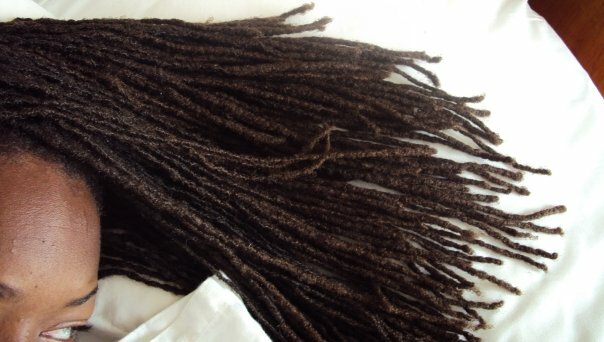 For some time, I've been torn about my locs. It was obvious that the length was taking a toll on the health of my hair and I've avoided the real solution for some time. I knew I would cut it eventually, but I did want to free form for a few months before The Big Chop II. However, a quick chat with Kristi from Kinki Rootz at the NIN Spring Meet Up confirmed what Amber and I suspected, but had not said officially: the cut had to happen first. So here we are. The loc renewal is official. It is a new day with a new look and Amber and I are creating a new regimen. Stay tuned! I spent the weekend with one of my friends who is newly natural. It was kinda of nostalgic listening to her ask questions about every product under the sun. 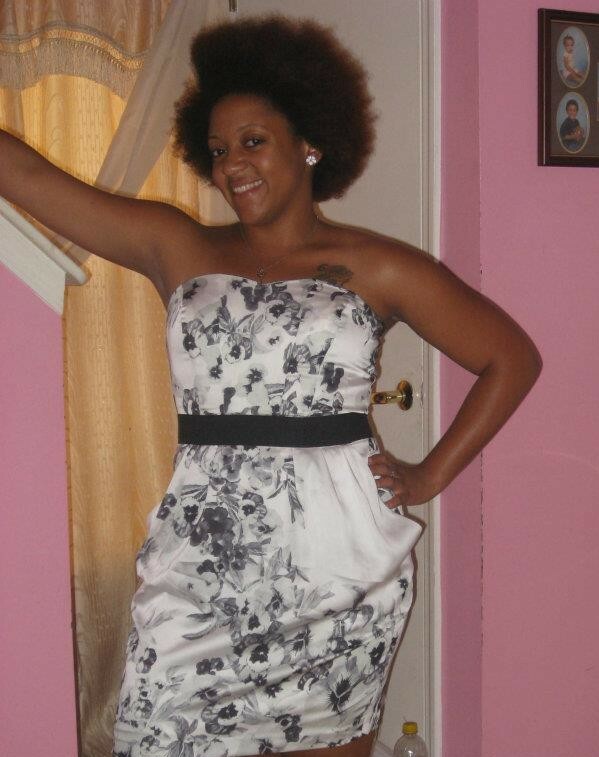 I remember how clueless I used to be when I first went natural. And I remember all the mistakes I made - but each mistake led me to learning more about my hair. i thought it'd be fun to discuss the 3 phases of being natural. Hopefully our newly natural readers can have soe faith on this journey. Believe me it will be exciting. For many of you, the Big Chop will usher you into this Natural Hair world. Whether you transitioned (grew you hair to a desirable length without adding chemical straighteners) or just took the razor to your scalp - you are here! I'm also including the BIG REVEAL/FIRST TIME USERS as some ladies have been natural for YEARS, but covered it up by wearing weaves or braids. Nevertheless, this is the first time you've had to take care of your hair and you may be clueless. 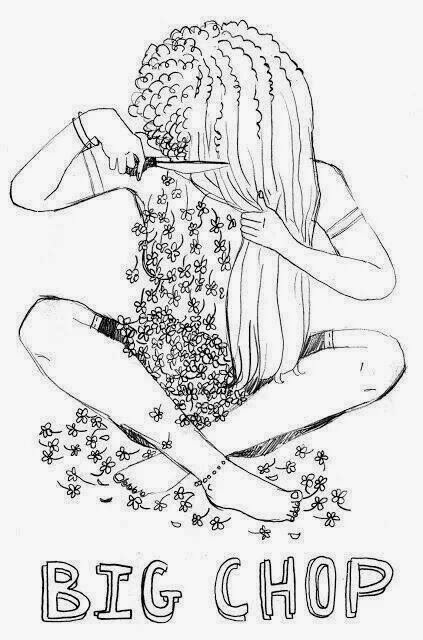 Your family thinks your crazy for cutting off "all that pretty hair". 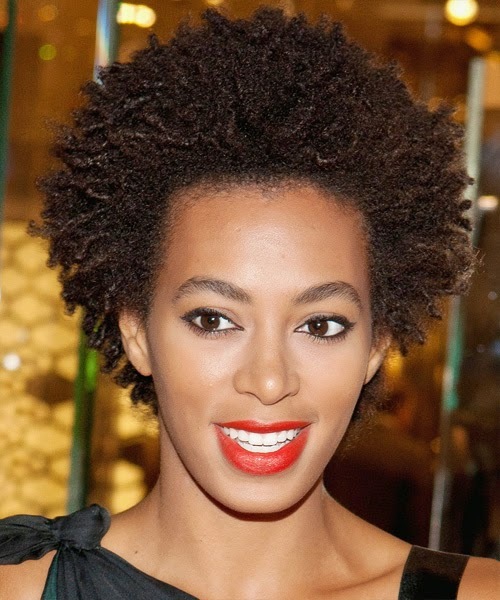 You've chosen a natural hair maven to copy and she's you new hair idol. Oh SNAP, you became a product junky! Curl-definers, moisturizers, shine enhancers, you have them ALL! Oh yeah, everything needs to be natural - no parabans or sulfates, or heat, not here! Every natural hair girl you see you ask her about her regimine, making mental notes to try that process. Some days you love your hair, some days you hate it, and some days you are TWO STEPS away from going back to the creamy crack! LOL! You spend your lunch-break reading natural hair blogs like Natural in Nashville. By second year of your Natural Hair journey you've got the hang of some things, but you still have questions. By now you've got a bit of length and you are trying new styles. You may even have a go-to look that you know is guaranteed to look cute and get compliments. You've visited a natural hair salon and she cut your precious strands too much claiming you needed a trim. You were MAD! You've figured out that sometimes 'un-natural' products help. You've mixed some products in your kitchen, DIY is your deal! Extra Virgin Olive Oil is your best friend - it's in that spray bottle, in you kitchen, and even mixed in you fave shampoo. You don't mind giving away products to friends. Didn't work for you, might work for her. 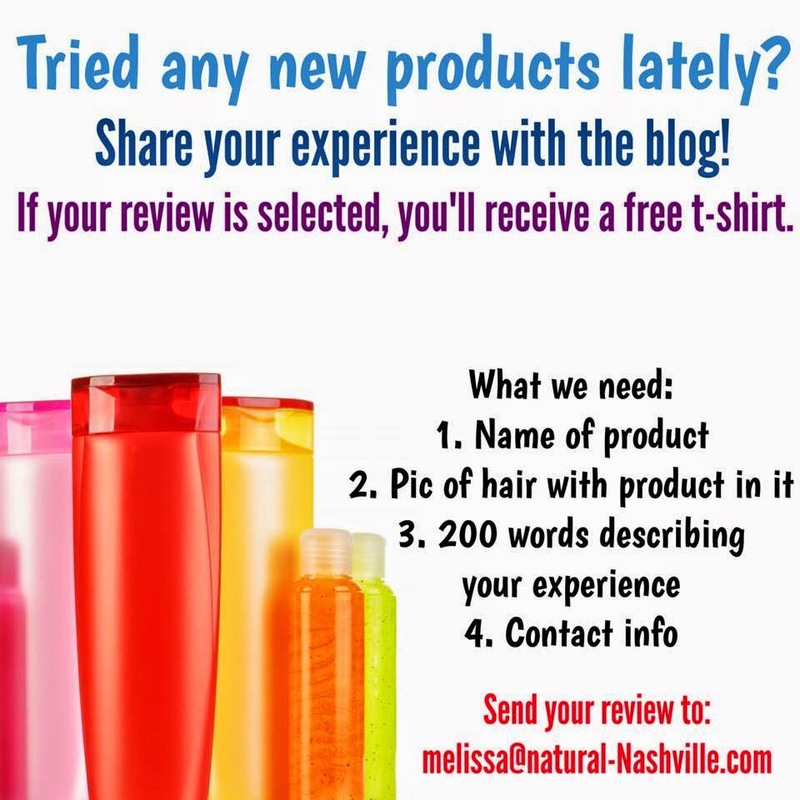 You have your 'go-to' blogs, you-tubers, and products. You still have bad hair days, but nothing that an elastic head-band can't fix. 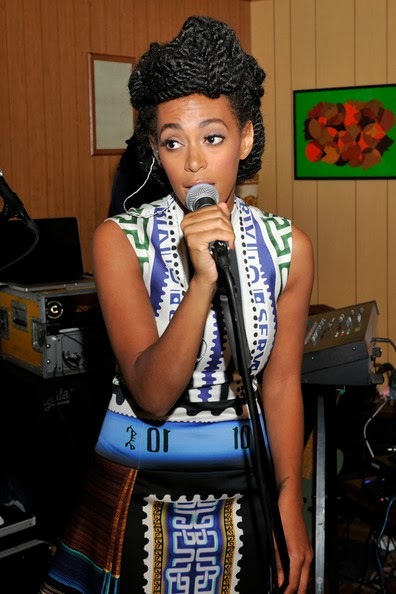 You think about LOC'ing your hair - you experiment with braids and extensions. Sometime, you still have hair envy - your curls just don't pop the way you want all the time. PHASE 3: Welcome to the comfort zone! I'm not saying that it will take you three years to get comfortable being natural, I'm saying by year three, I guarantee you'll be comfortable. By year three (and beyond) you've found the length that works for you and the products too. No longer the product junky you once were, you've become the guru for family and friends - you may even start a blog or a You-Tube channel. Some of you friends or co-workers can't remember you with relaxed hair. You've had your hair heat straightened and you weren't scared about it. You are thinking about Re-Chopping your hair. You are no longer attached to the elastic headband, although, you know exactly where to find one. 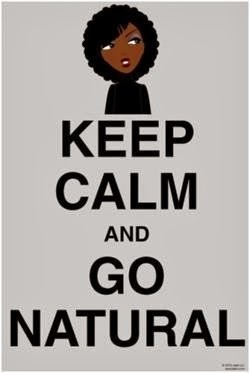 #TeamNatural #NaturalNazi - you don't care as long as you hair looks good. A good trim, you know who can do it and when it's necessary. You family is finally happy with the way your hair looks. I hope you enjoyed this list. Of course alot of this is meant to be funny but some of it is very true! 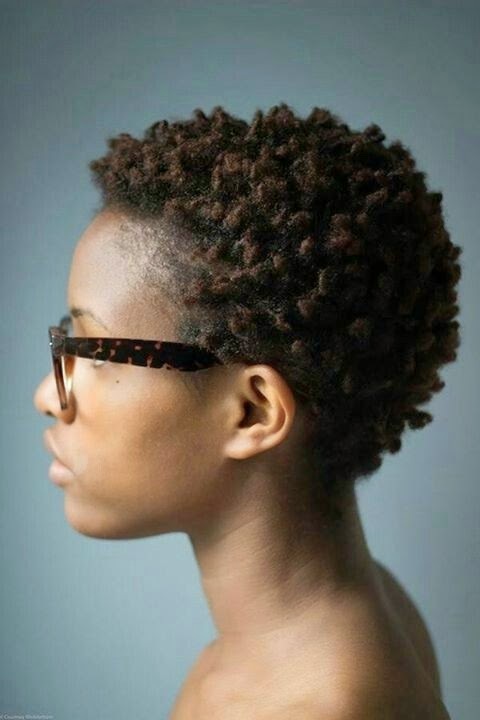 I just want you newly naturals to know, IT GETS BETTER it just takes patience. Readers, where are you in your natural journey? What have you experienced? Kid Kool: Kicking it Old School! This weekend I had the pleasure if giving my godson a 'mini' makeover. For the last three months, he's been growing out his hair to get a new style. Well, new to him … not to us. 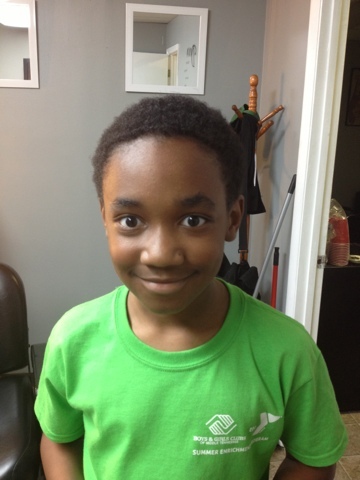 My godson, J'halin, went to a consultation with my favorite barber, Tristan (celeb barber to the stars) who told him how to maintain his hair until he got his new cut. After that, I watched my little homie go through what a lot of us ladies go through when growing out our hair. He had to learn how to take care of a longer length, wash it more often, and learn what moisturizers kept his "head from being itchy." It was a struggle for him. 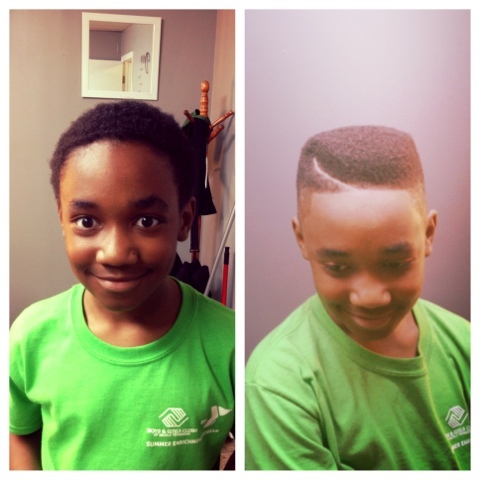 His mom made him learn to take care of his hair because this was the first time he was able to choose what type of haircut he wanted. In the end, he was able to rock his new style: A modified box fade with a side step part! Kicking it old school like Omar Epps from the movie 'Juice'! Thanks TRISTAN for the amazing haircut! Almost had me thinking about cutting my hair again! 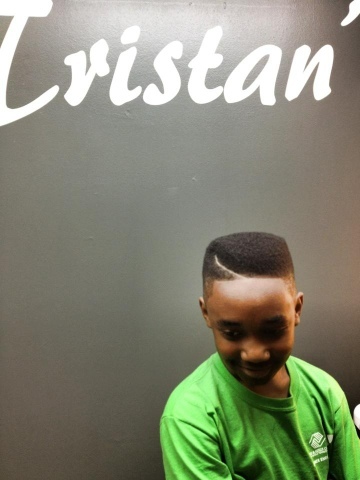 Wanna get you little prince a fly cut? Contact Celeb Barber, Tristan, here. Over the past few weeks, I've become a lot more relaxed about my hair. I decided to Let It Breathe for a bit and that decision calmed my energy tremendously. After allowing my locs to free form for a while, things are getting too tangled and its time for some maintenance. As always, chilling out helped me to see some things clearly. 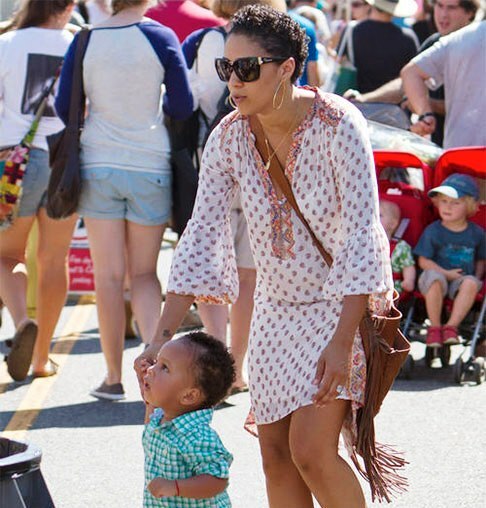 One half of the Mowry sisters, Tia Mowry, just chopped her tresses! Tia left her role on BET's The Game in order to put her foot in more endeavors. The new mom and new author, who is known for her long hair, was spotted in CA with super short curls. I feel like this will define her as an actress. She looks very mature and lovely! I promise we did not plan the matching blue tops. I swear. During my friend Melanie's and my 12 year friendship, we have talked about pretty much everything under the sun. But until recently we rarely ever discussed our racial differences. We just have so many things in common that discussing our differences just barely ever comes up. Well a few months ago Melanie asked me if I would be interested in watching Chris Rock's documentary Good Hair together. "I just think it would be so fun to watch together." she said. Having already seen the film, I chuckled at the thought of my possibly having to further break down certain things in the film regarding my culture for her. Then something dawned on me. Melanie was interested in this movie because she was intrigued about black hair. To say that I was less than intrigued about a white woman's hair would be an understatement. I'm just going to be honest here. At the time, I felt like ever since I was a little girl I've been overloaded with knowledge about the European standards of beauty. Unless I bought a magazine that was geared towards black women, chances are that every other magazine had articles that catered to enhancing the beauty of white women. And really with all that I have had to do to my hair in over thirty years from weaves to braids to bi-level stacks and The Big Chop, I could not fathom that the plight of the white woman to keep her hair in check could even compare. And wasn't their hair pretty much all of the same anyway? Does that sound a little close minded to you? Yeah me too. That's why I changed my mind and came up with an idea. "Why don't we watch the movie and do our hair together?" I said. Saturday was coming up and with that being my Big Hair Day consisting of pre-pooing, washing, deep conditioning, etc,. 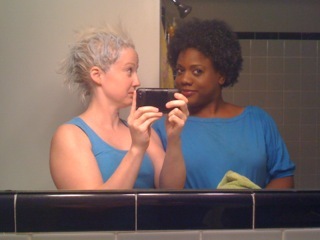 I figured we could really get into what it took for us to individually maintain our hair. This was perfect timing as Melanie's own "Big Hair Day" was coming up because she had to touch up her roots with hair color. She loved the idea and we set a date. When I decided to wear my hair in it's natural state, I was desperate. It was falling out in patches and I felt like I was loosing my mind along with my hair. It was just a few days before I graduated from college and my classmates were taking pictures to capture the moment we had worked so hard to achieve. Between a creative best friend, a few scarves and the cap required for the ceremony, I survived the weekend. I have a friend that started her locs a few months before graduation, so I decided to follow her lead. 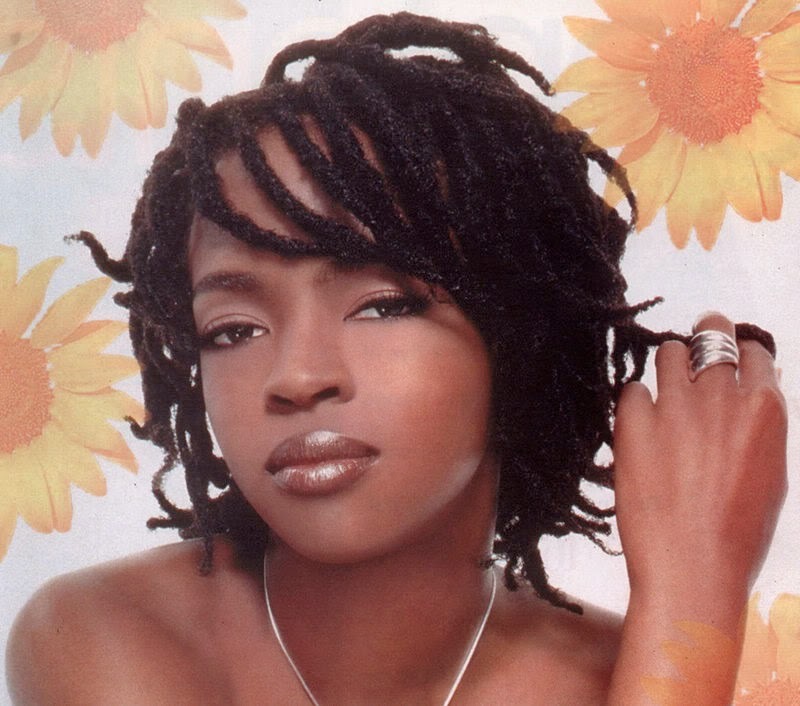 I did not know much about locs then, but I knew more than I ever wanted to about relaxers. At the time, I thought my classmates might question what was going on with my hair that weekend for the rest of our lives, but I decided I wasn't going to wonder any longer. 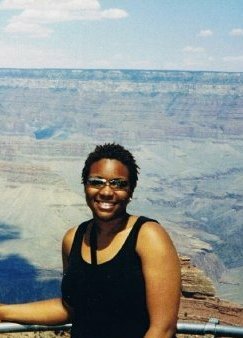 In March of 2002, I was ready for The Big Chop. A close friend was my stylist at the time and when she hesitated, I channeled Angela Bassett from Waiting to Exhale and started cutting. "Going natural looks good on you, but it wouldn't look right on me." I hear this way too often. So I've been thinking, and I have a theory. 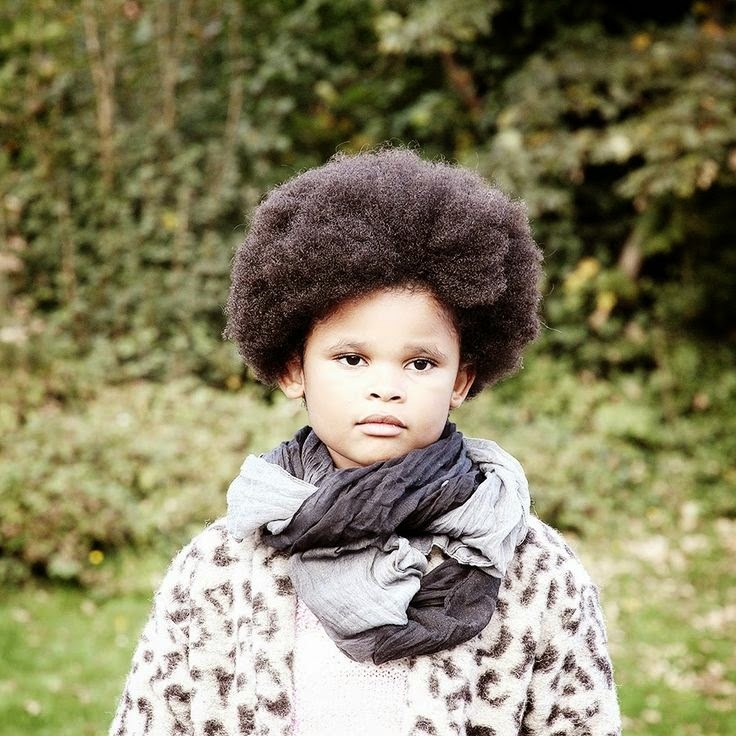 I don't think it's only the hair that makes natural hair 'not look right'. I think we are so used to hiding our faces behind long hair that the thought of our face not partially hidden under a cloak of hair is a bit unnerving. Have you taken a minute to look at your face? I mean.. REALLY look at your face? 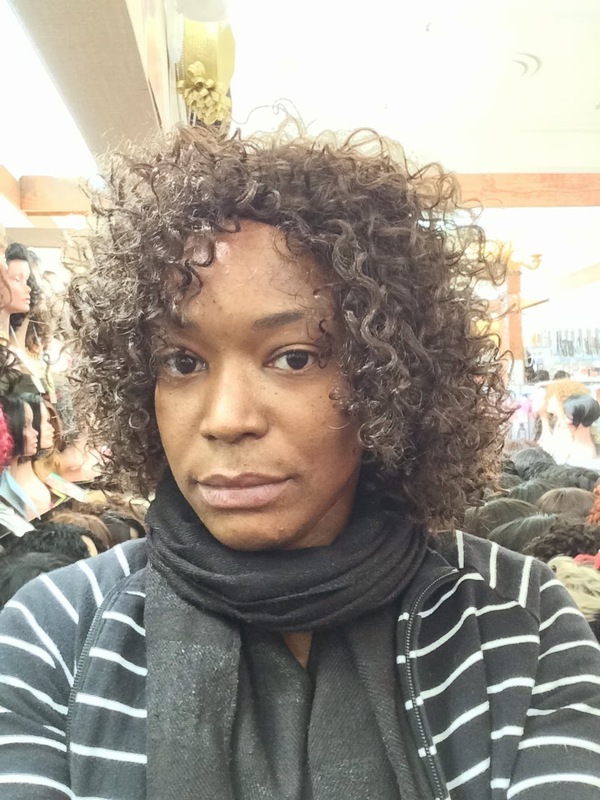 What's so scary about a face your face that you can't imagine wearing your hair curly? It's okay. I had to get acquainted with my own face. I also gathered some naturals at different stages in the journey to share their feelings about their faces after going natural. So... here's me before going natural. My hair was almost always at least shoulder length. I was well aware of my forehead. And my whole head. It's big. I cut my hair (first picture), but still kept my forehead covered. It was like second nature. I was self conscious. That's why I transitioned for a year instead of doing the big chop. 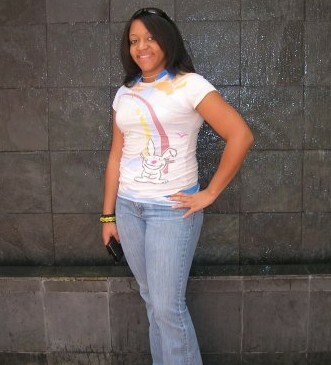 Shana has worn short hair for years: long before her big chop in November. 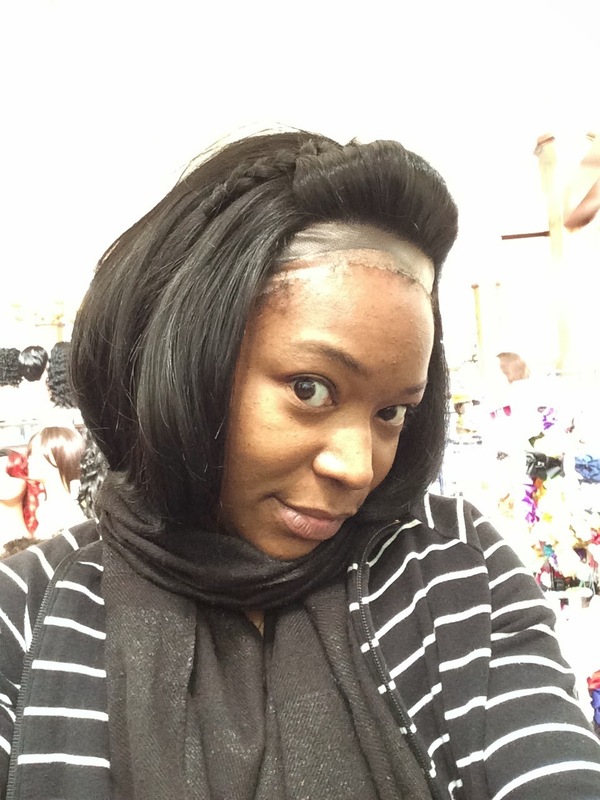 She was self-conscious of the shape of her head before going natural. But she decided that natural was the way to go. 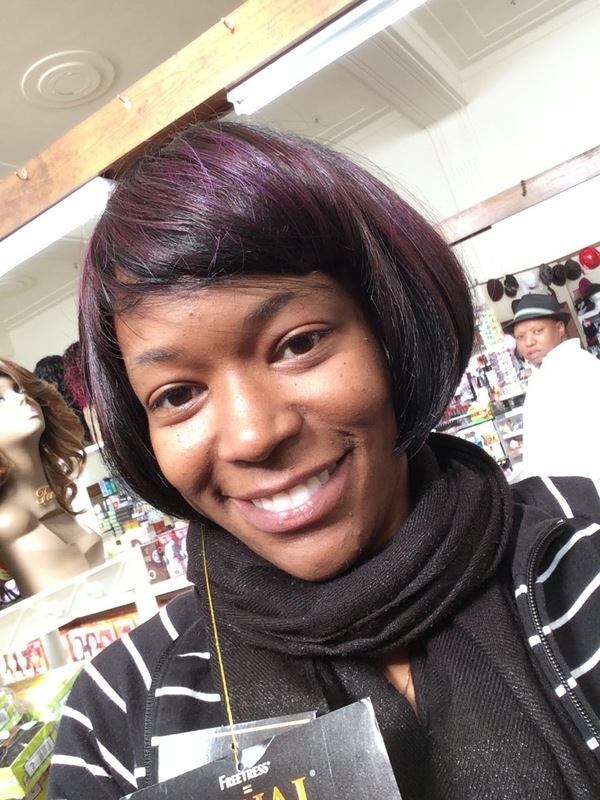 After going natural, Shana has more of an appreciation for her natural features. The biggest change for her was a "natural state of mind". She considers going natural the best decision she's made regarding her appearance, and is really happy to start her hair journey. This was Sade with a relaxer. I love her pretty hair. The jury is still out on what Sade noticed about her own face. So I'll tell you what I noticed. She's 'girl next door' cute. Her face stands out SO much more. She's a doll, and much prettier. THe shape of her eyes stand out so much more. She doesn't look different. It's just that everything is... "er". Her smile is smiley-er. Eyes are pretty-er. She looks the same. Except the face in THIS photo would shand out much more in a crowd. I know we all have insecurities. But if you're afraid that your natural hair won't "look right" because of your facial features, RELAX! There are unique things about all of us. But these differences make us unique. Never be afraid to flaunt your natural beauty. Your face was made to "look right". You never know what you might find underneath your side swoop/bangs/face framing hair. DISCUSSION: What's my hair type? I hope you had a wonderful holiday season! The NIN crew rested quite nicely - visiting family and friends. But now it's time to get back to business. So since this is a new year, I know many women are making resolutions and some of you were directed to this page because you did the big chop! If you did, good for you! Now you have the question of all naturals - what is my hair type? A couple weeks ago I found this handy hair type guide. The hair typing system widely used by natural women was created by celebrity stylist Andre Walker. I felt this was one of the best illustrations to describe natural hair types. 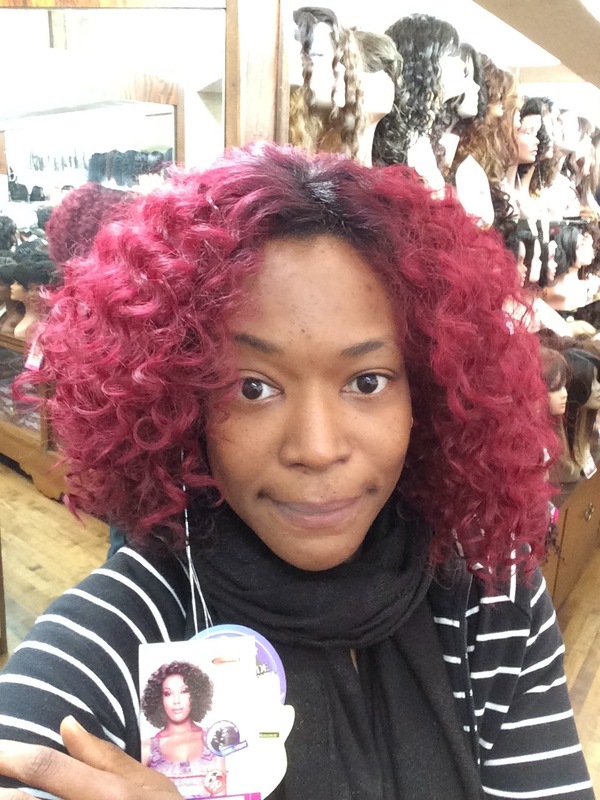 Finding your hair type is the first step to figuring out what products you want to use to get the results you want. As your hair grows, your hair type will change. 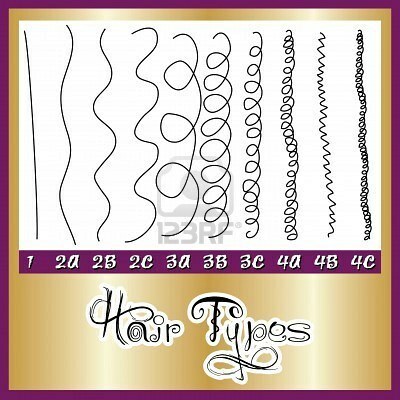 You may have several different curl types on your head. Like me, I have am mostly 4a but I have 3c hair on my sides - weird but true. So, get ready! Keep in mind, no hair type is better than the other. In addition, no hair type grows faster than the other. 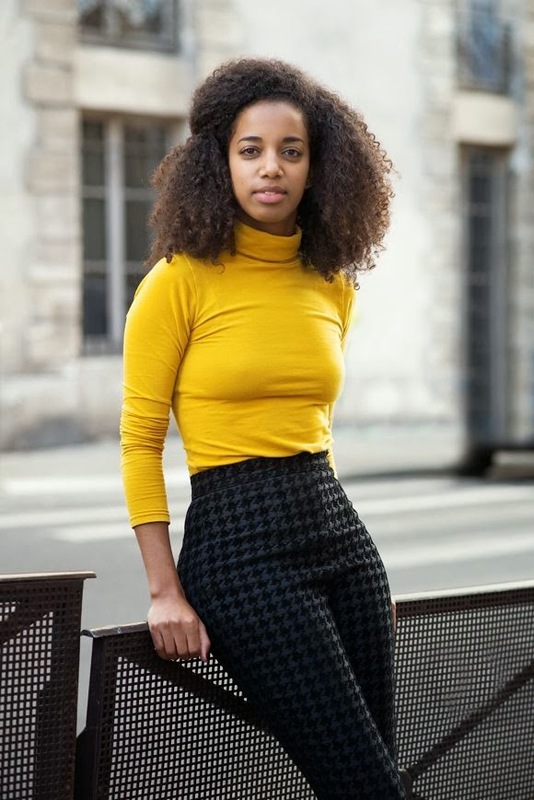 The key to growing longer and stronger natural hair is retaining moisture, protecting the ends of your hair, and paying attention to what your hair needs by developing a regimen that works for you. This process takes patience, but you can do it. You can grow your hair to great lengths without chemicals. 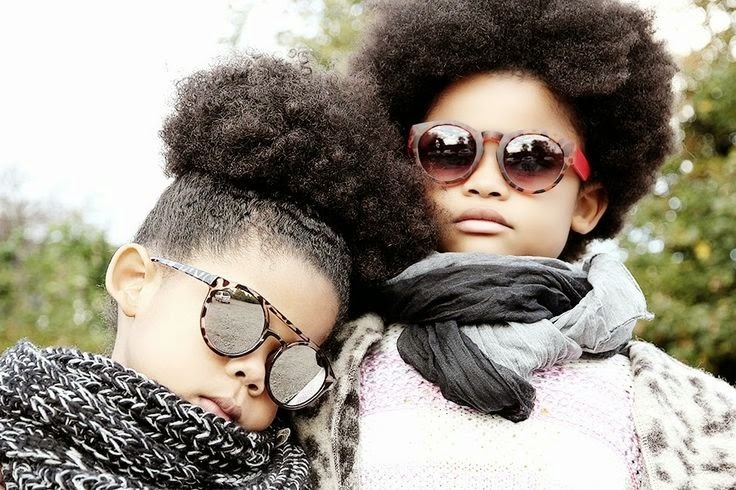 Check out NaturallyCurly.com they have the best listing of products divided by hair type.